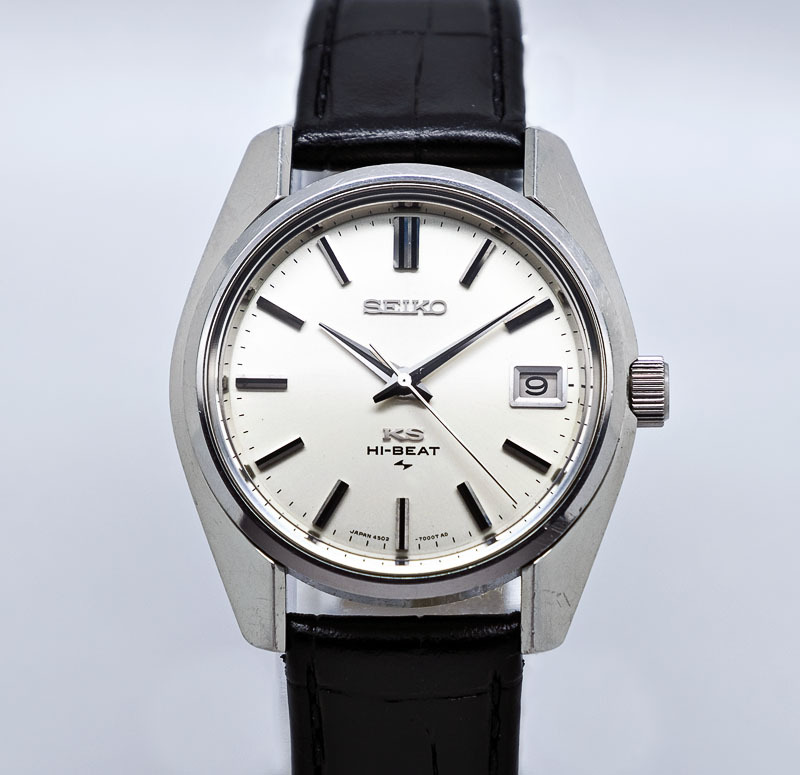 This particular watch, a King Seiko 4502-7001, was produced in July 1973 towards the end of a wonderful period of creativity for Seiko that started in the early ‘60’s and which was driven forward by some very healthy inter-corporate competition between the Suwa division, whose factory was in Suwa, Nagano, and the Daini division, whose factory was in Kamedo in Tokyo. 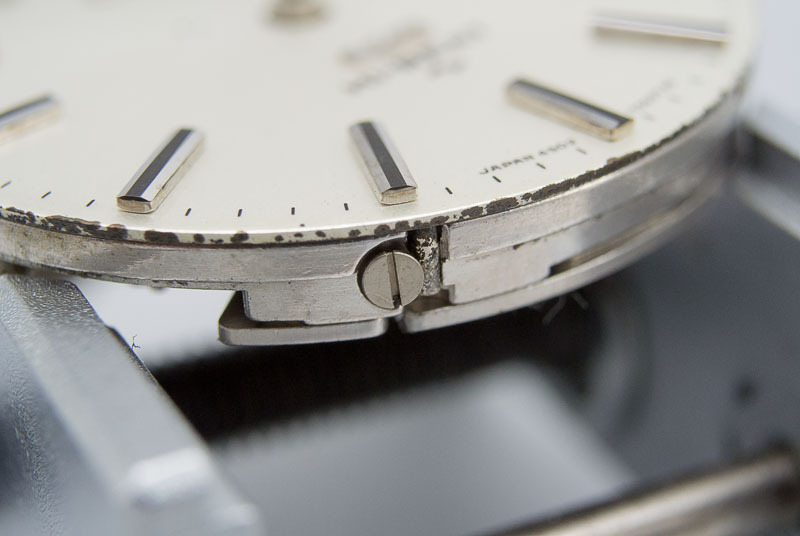 The former was responsible for the creation of the first manual wind and automatic Grand Seiko’s all of which used movements whose architecture was rooted in the same basic design dating from the late 1950’s. 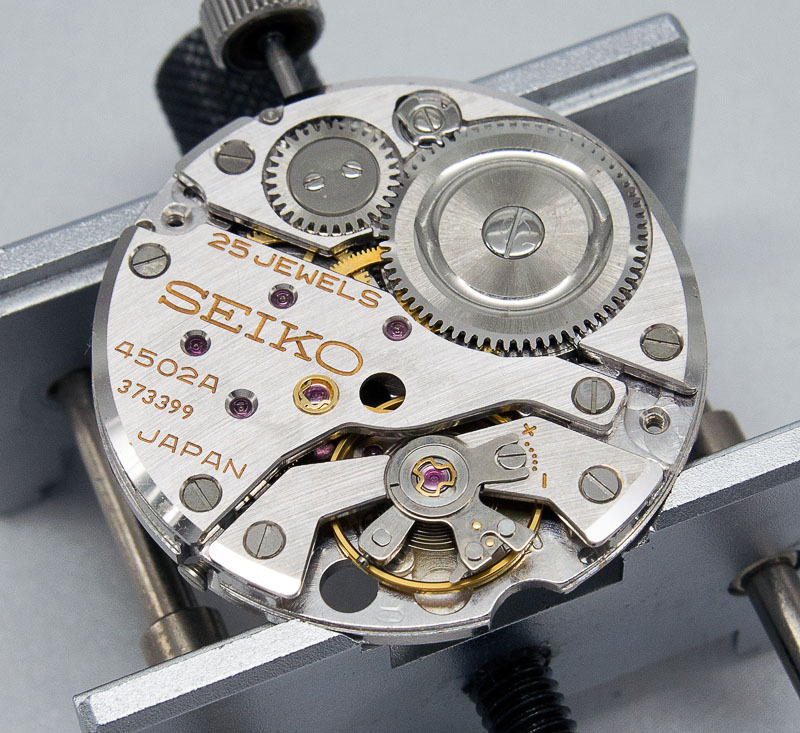 In parallel with that line, the Daini division developed the King Seiko sub-brand, latterly using freshly designed movements that incorporated modern technological features and whose performance had the potential to outstrip that of the Grand Seiko movements whose development followed a more traditional iterative process of refinement that relied on increasingly high jewel counts and careful production and regulation. 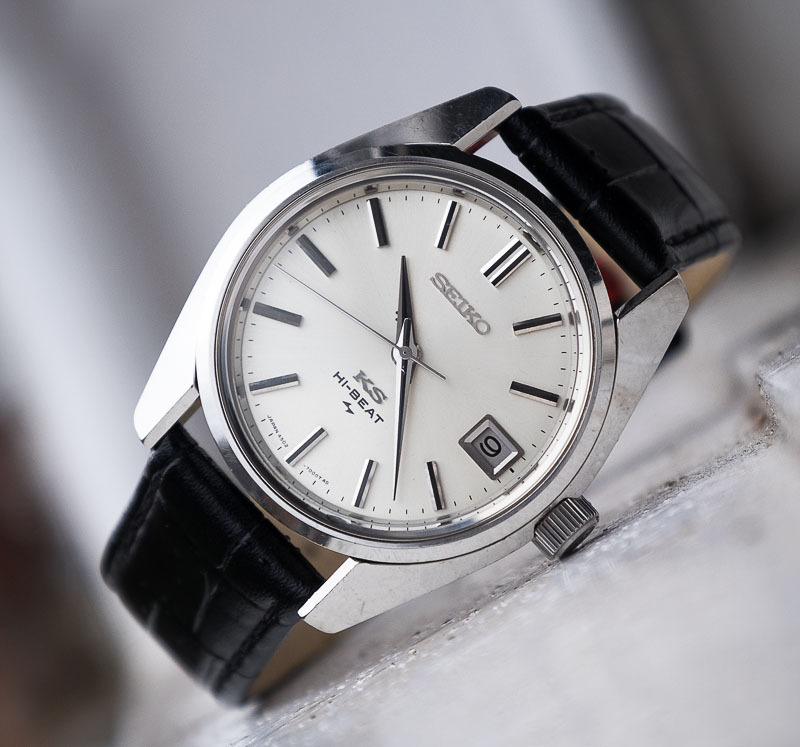 Later Grand Seiko’s of this era would adopt Daini-developed movements in recognition, I think, that they moved the game on rather more convincingly. 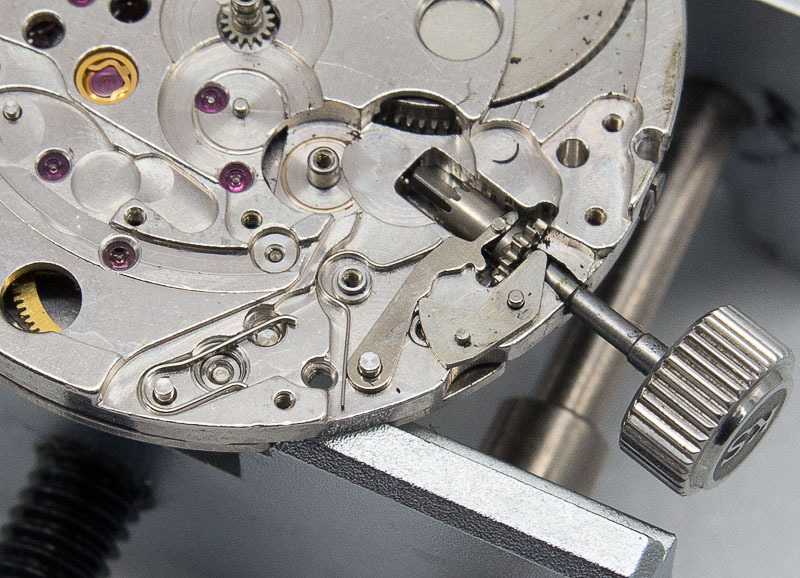 Of course, little did they suspect at that time the extent to which the whole industry would be rocked by the development of the quartz movement. 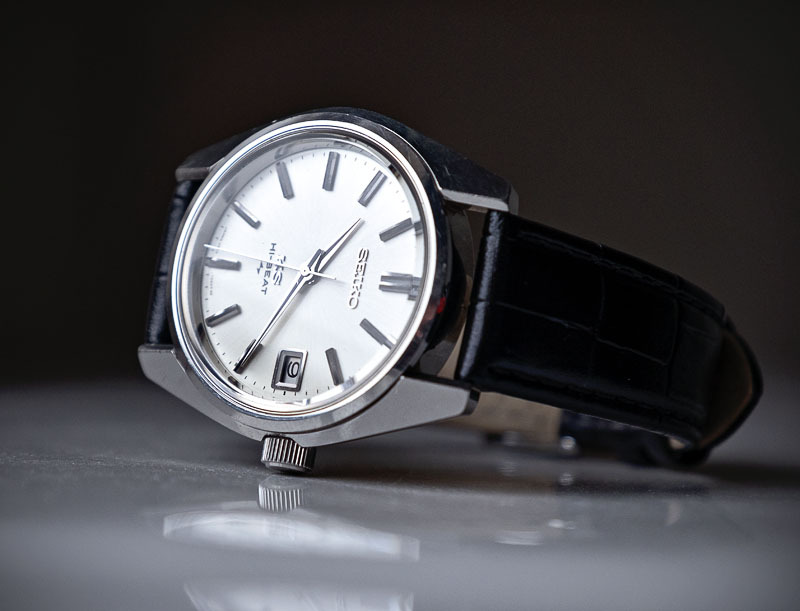 High end Seiko mechanical watches would effectively wither and die by the mid-1970’s only to revive a quarter of a century later with the re-emergence of Grand Seiko in the late 1990’s. 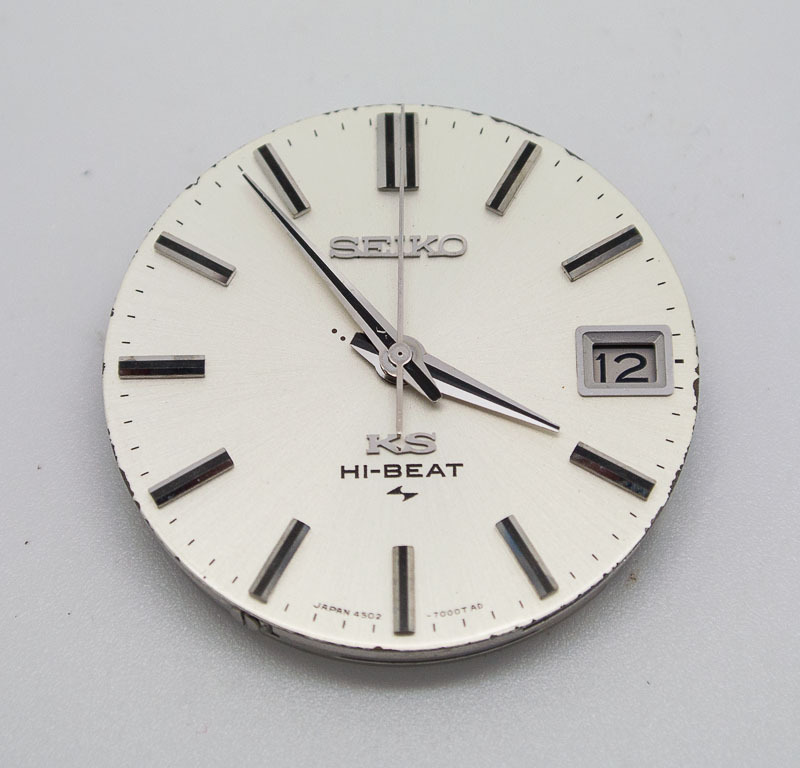 The King Seiko 45 series watches are notable for the extraordinary beat rate at which they run: the HI-BEAT boast on the dial is no shallow marketing exercise (a charge that might reasonably be leveled at some of the highest jewel count 62-series models). 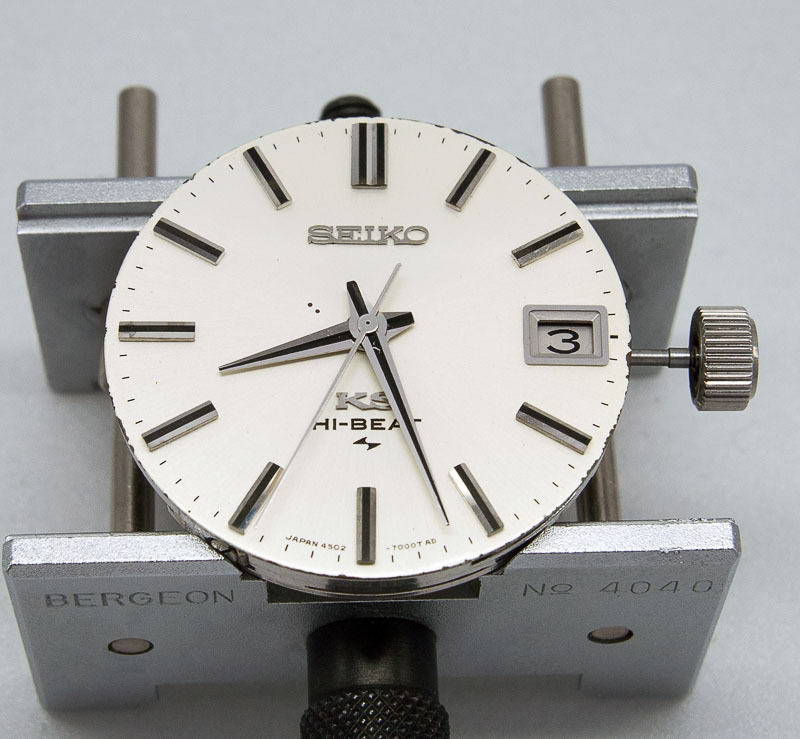 The 45-series movements run at 36000 bph, almost twice as fast as the rather more leisurely 19800 bph of the automatic 6245 Grand Seiko movement described in the previous two posts here and here. 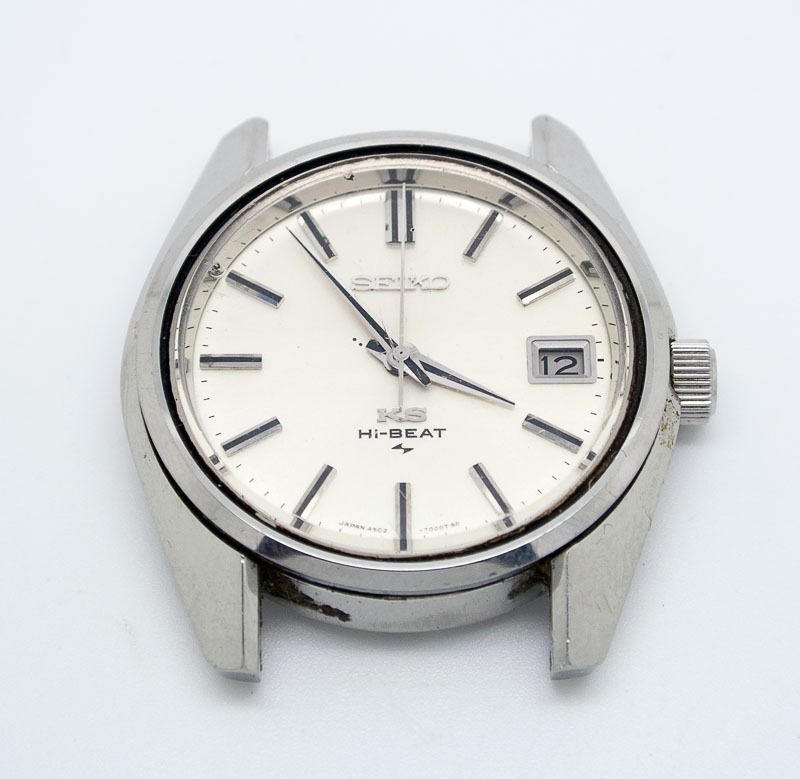 One other notable feature of the dated 4502 fitted to my watch is that the date change is instantaneous, again contrasting with the slow but steady approach taken by the 6245. 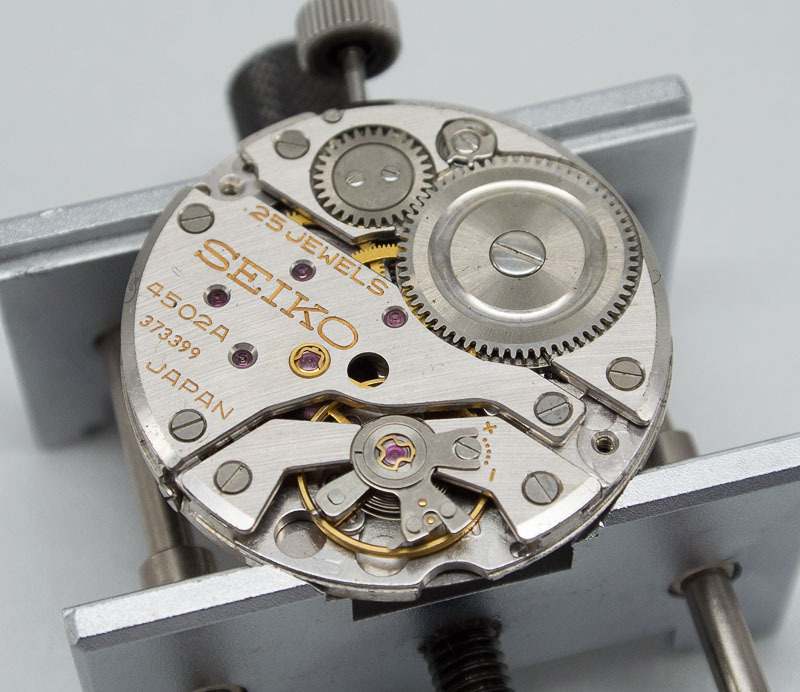 We discussed instantaneous date change in the context of the Rolex 1575 movement fitted to my 1603 DJ here and so it will be interesting to see Seiko’s approach to this feature. So, let’s get on with the story then, starting as usual with a quick appraisal of the watch as received. 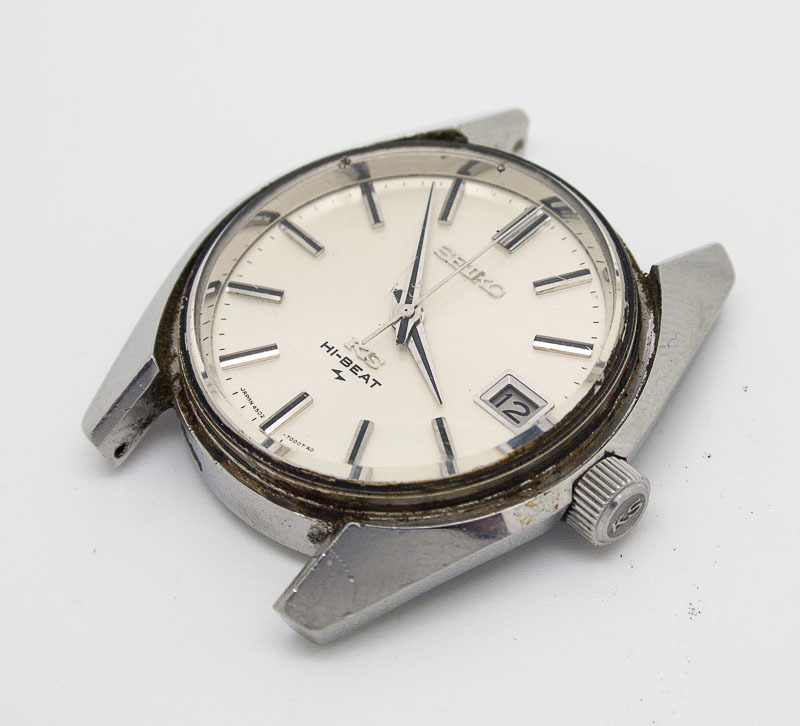 In almost every respect, it is what I always hope for: an unmolested, unrestored, original watch in generally excellent condition but requiring some attention to revive to fully operational. In the latter respect, this example, whilst just about running, was doing so at a much-accelerated rate, suggesting something fishy in the balance hairspring department. The case shows some obvious signs of use but has sharp edges and looks really tidy overall. The wear to the case back is light, barring a couple of minor case back opener slippage marks, and the gold KS medallion is present and correct and in excellent nick. 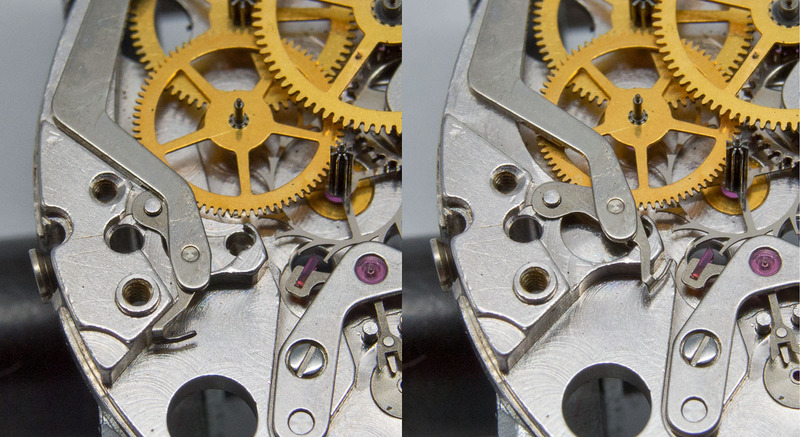 There is always a slight concern that corrosion might have affected the channel in which the bezel sits on watches with cases such as this and so before removing the movement, I popped out the bezel to take a quick peek. 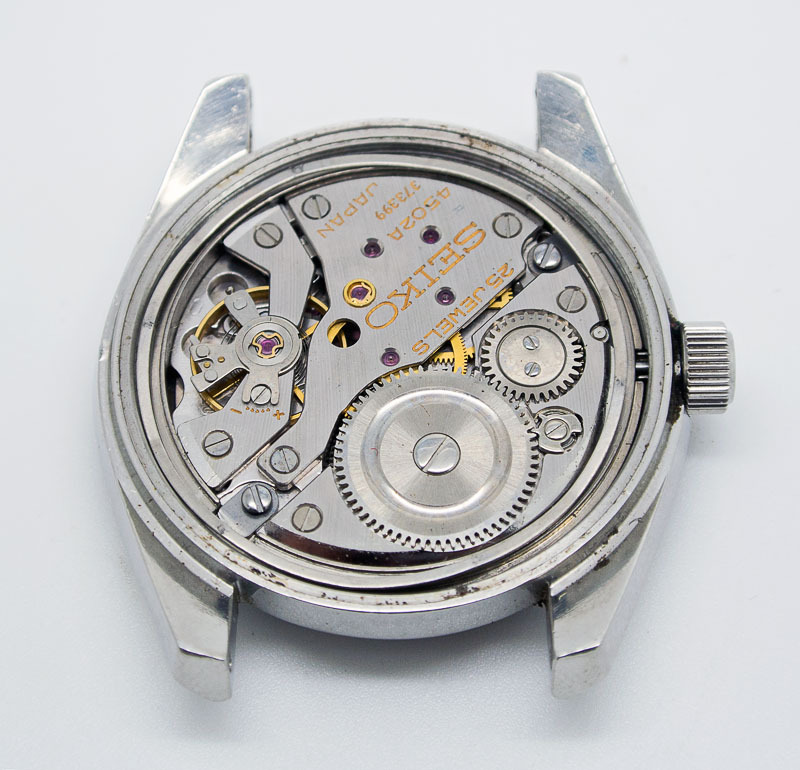 Plenty of grime and some minor surface corrosion but nothing to cause any concern and so off comes the case back and we can take a look at the 4502A movement. It is refreshing to be greeted by something that looks so unfamiliar, having recently spent so much time working on 62 series movements. The layout for a manual wind movement looks conventional enough with separate barrel and train wheel bridges but with a balance supported by its bridge on two sides. The train wheel layout, which we will get to shortly, looks somewhat unconventional to my eyes. 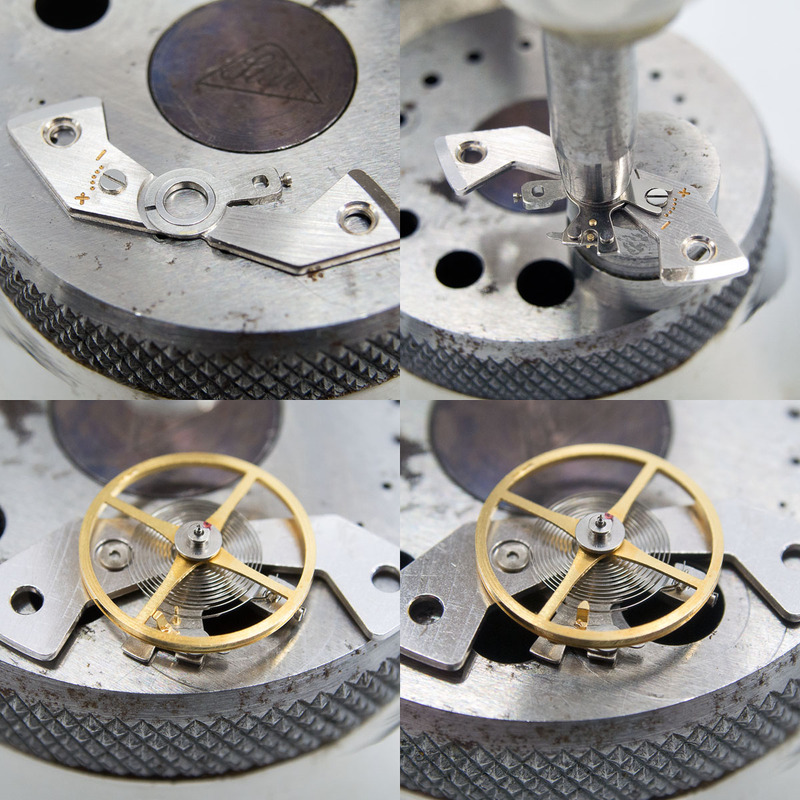 The movement is secured in place with the movement tabs, and so with these and the crown and stem removed, and the case spring set to one side, the movement drops out easily enough. 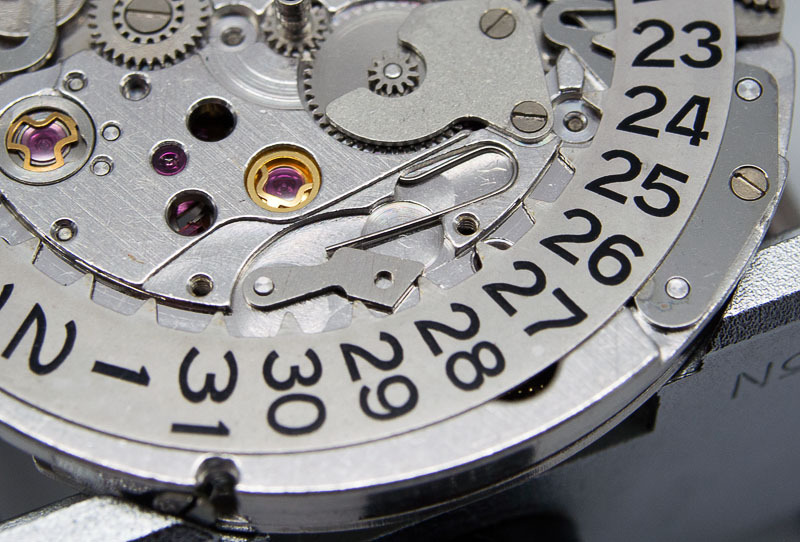 and remove the dial, revealing the calendar apparatus with its intriguingly off-centre date wheel. 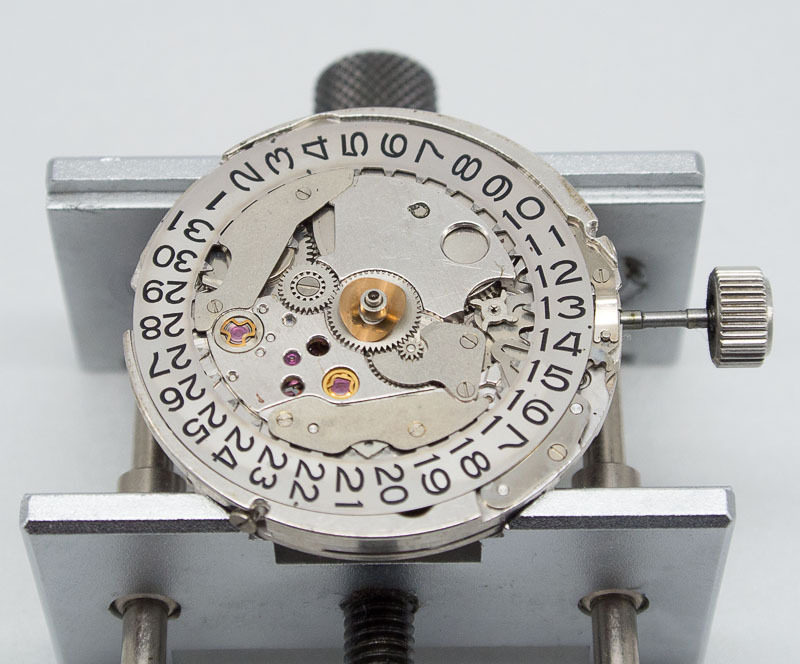 It all looks neatly laid out and decidedly modern (by which I mean designed after 1965), the most conspicuous element of which being the instantaneous date change mechanism which can be observed once the date wheel and guards have been removed. until the balance is removed and we see the source of the problem. followed by the train and barrel bridges. 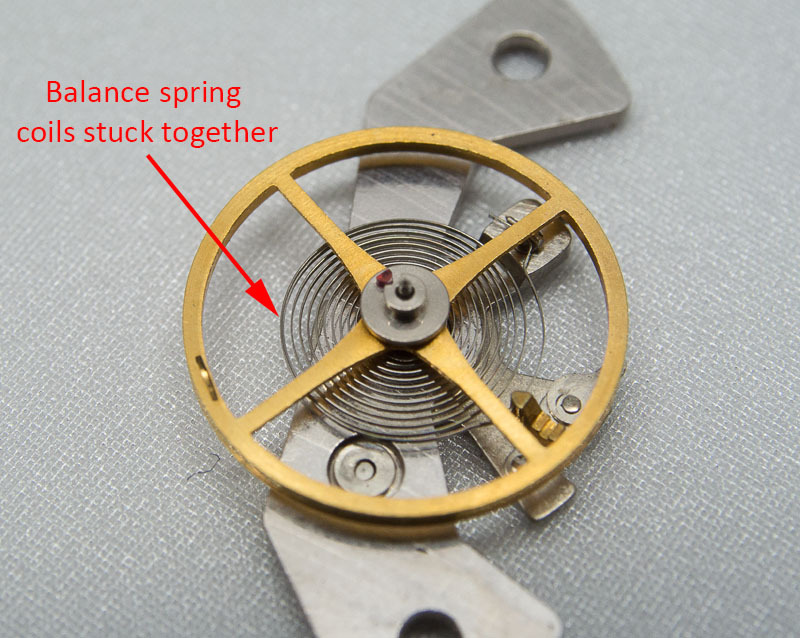 The view above shows the complicated construction of the hacking lever, its three components connecting the groove in the clutch wheel all the way across to the other side of the movement, where the final dog-leg makes contact with the balance wheel to stop the movement when setting the time (below). With the train wheels out, the length of time since its last service becomes apparent with plenty of dried oil, grime and grot liberally sprinkled around the main plate and minute pinion bridge. 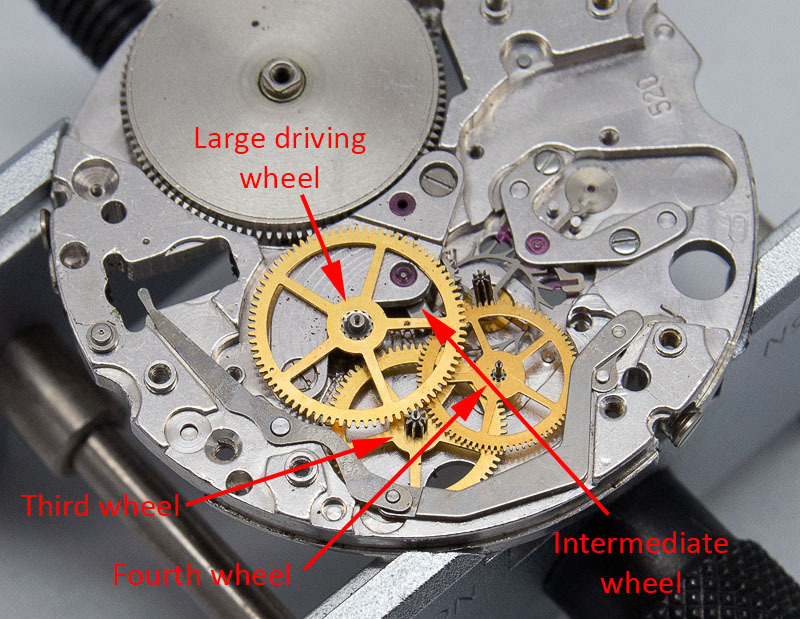 which then drives what Seiko call an off-centre large driving wheel and pinion via the intermediate wheel mounted beneath the barrel driven minute wheel bridge. The large driving wheel then transfers power to the third wheel which transfers it on to a fourth wheel located well off-centre. The fourth wheel connects to the escape wheel which, in addition to driving the balance via the pallet fork, also drives the centre seconds wheel. 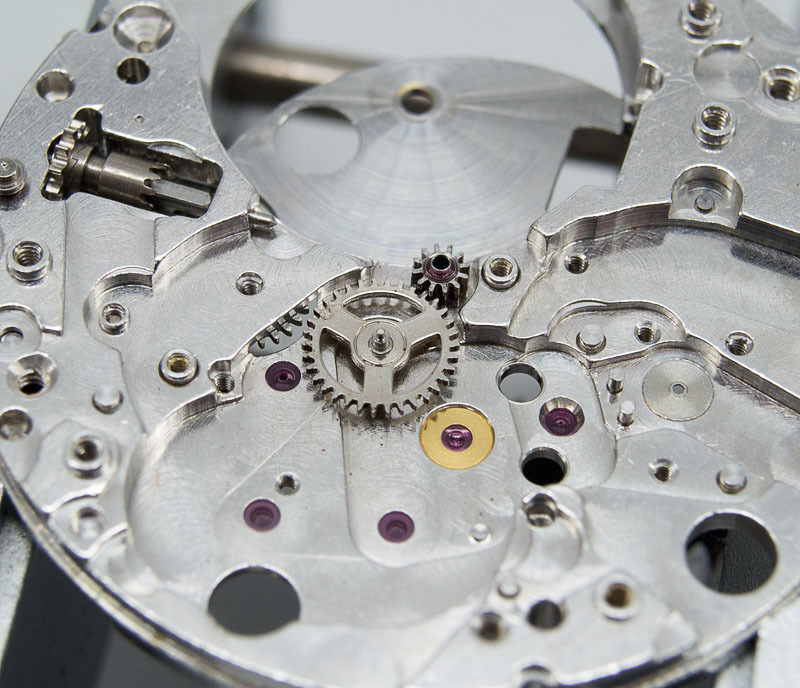 Although the movement does not look obviously filthy, quite a lot of the surfaces are coated in a hardened film of old oil and the cleaning process requires extended ultrasonic time in addition to a double dose of cleaning machine agitation. With that underway, we can turn our attention to the case. 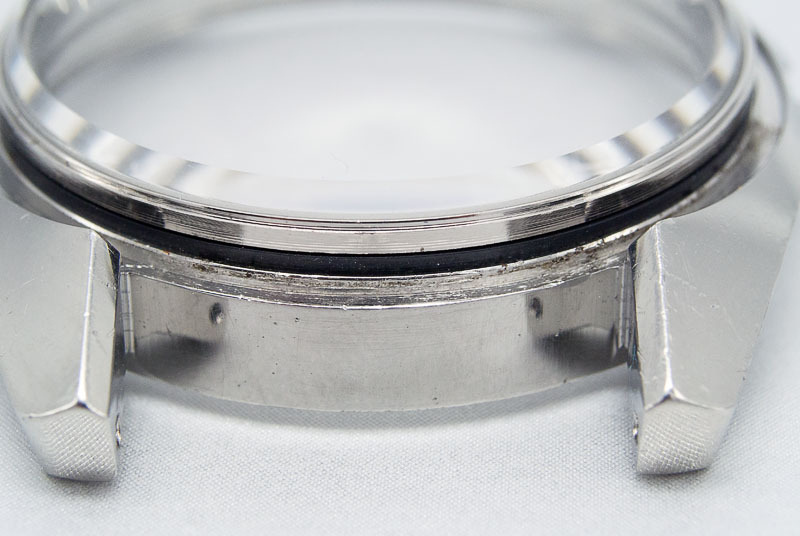 The grottiest part of the case is within the bezel groove and some of the interior mating surface where the crystal sits. Most of this is dirt or light surface corrosion and cleans off nicely with a toothpick but some is slightly deeper corrosion and I do my best to eliminate and smooth away as much as I can. 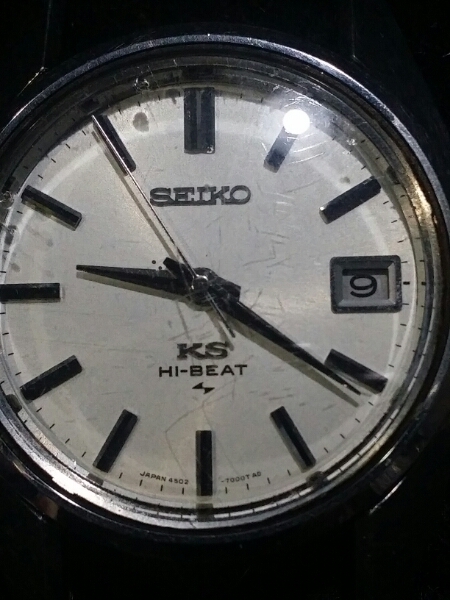 The crystal construction on this watch is a little different to that on most Seiko watches. 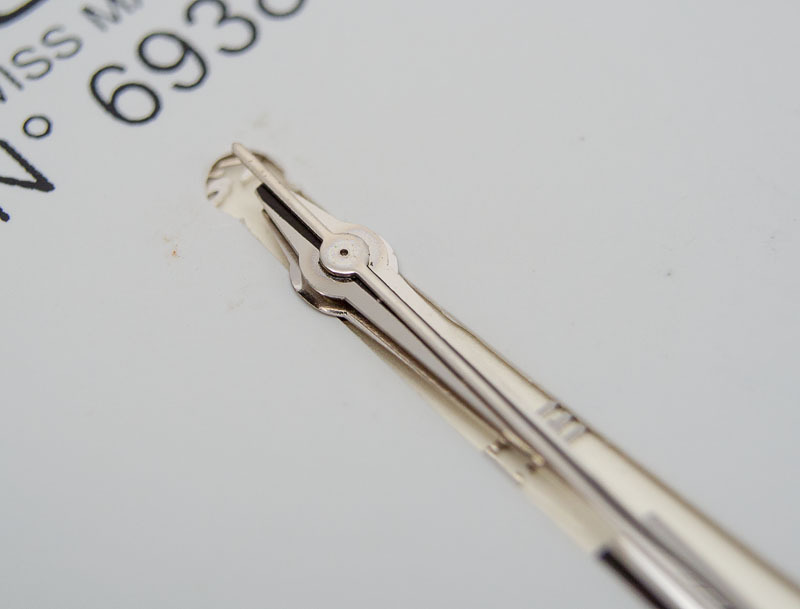 The crystal itself is Hardlex tempered mineral glass bonded to a chromed metal ring that serves as the dial ring. 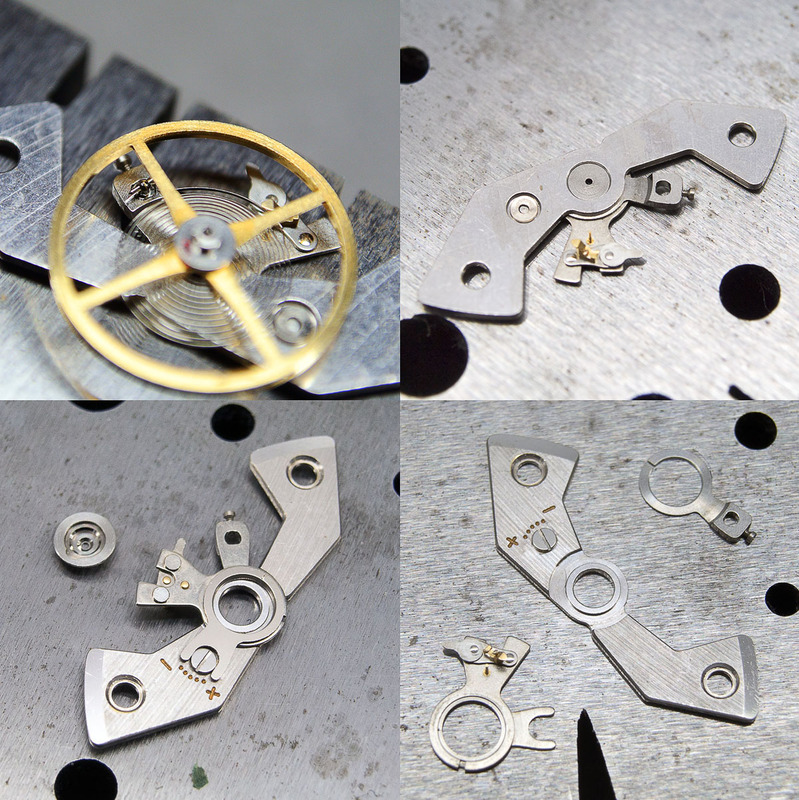 The whole assembly sits on an L-shaped rubber gasket that then seats against the dial aperture in the case. 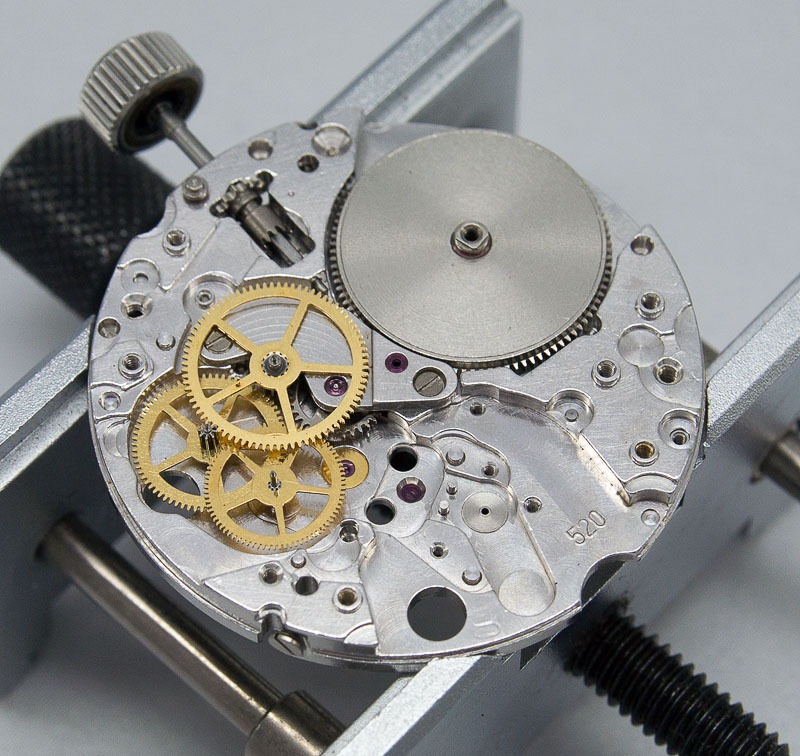 The arrangement is perfectly sensible but old stock availability of the crystal is limited to the extent that for some models featuring this type of crystal, replacement can prove almost impossible or requires that you spend amounts of money disproportionately large compared to the purchase price of the watch itself. 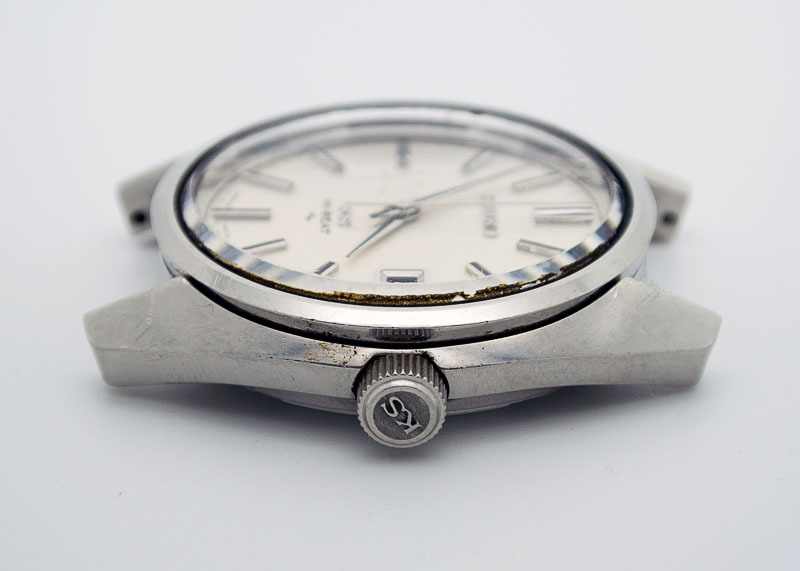 It is always worth checking out spare parts availability for any watch before going ahead with its purchase. and one of the new gasket fitted to the underside of a new crystal. ready to be secured into position by the bezel. secured in place by their bridge. Next we fit the cannon pinion, the keyless works and some of the motion works. before the fiddly business of reconstructing and fitting that three part hacking lever. With the barrel bridge, train wheel bridge, crown and ratchet wheels plus click in place, we are all set for the balance. and we can hope that the watch might now run more or less to time. 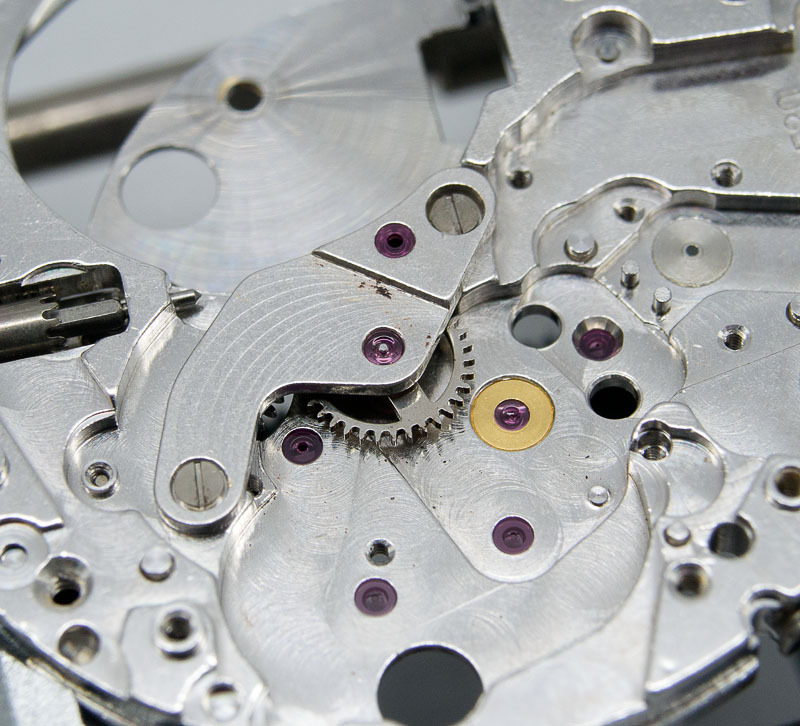 After cleaning, reassembly is simply the reverse process, but requiring a little additional work on the balance spring to make sure the outermost turn runs cleanly through the curb pins of the index lever throughout its range of adjustment. secured in position by the date cam jumper guard before fitting the date finger itself. 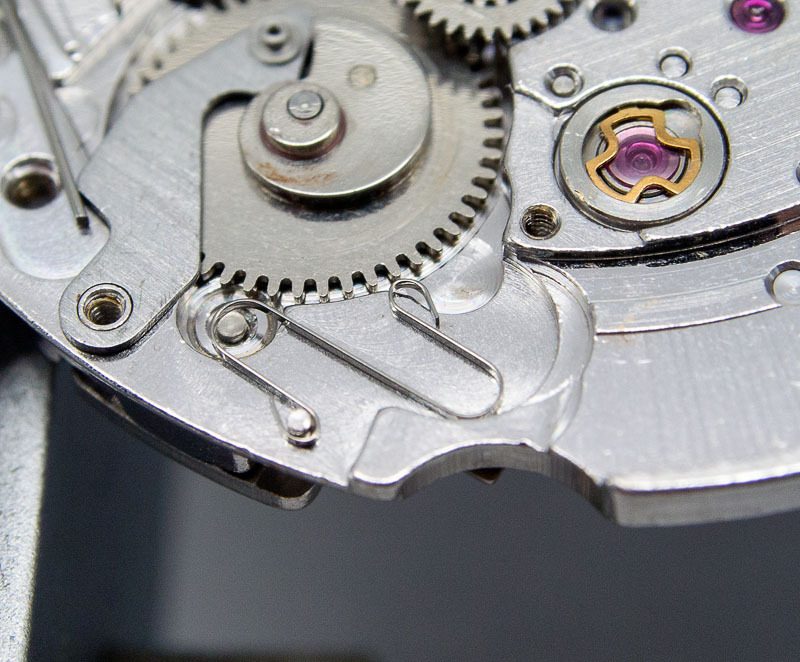 As the date cam turns clockwise, the inner edge of the finger rides along the eccentric surface of the inner raised lobe of the cam, thereby moving the tip of the finger inboard, away from the inner teeth of the date wheel. 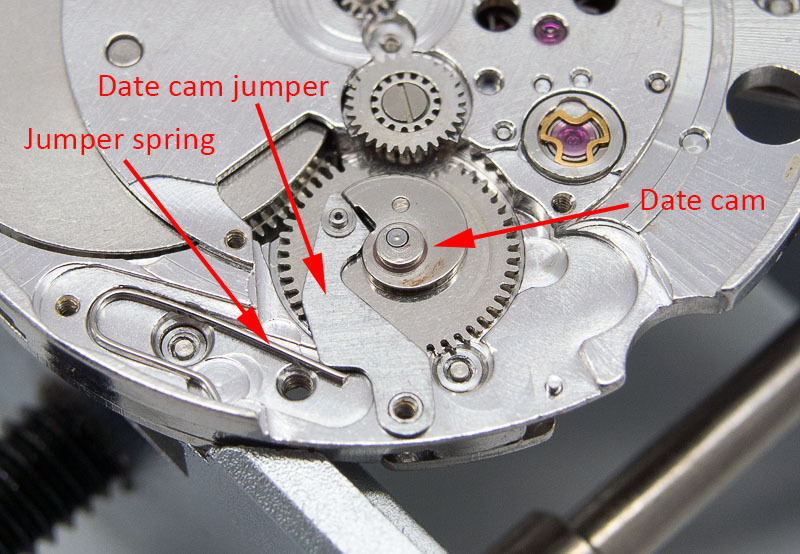 Simultaneously, the passage of the date cam jumper along the outer edge of the lower surface of the cam causes the axle to which the finger is secured to move to the north east (in the photo above) until the jumper slides down the cam cliff edge, instantaneously flicking the finger against one of the teeth on the date wheel thereby changing the date, the whole process regulated by the date jumper. 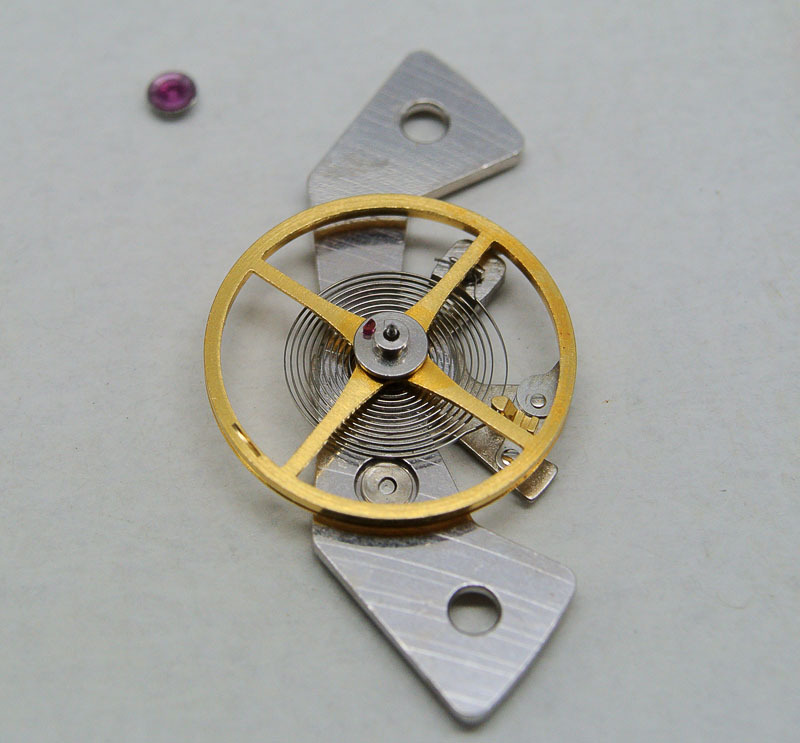 and we are ready to refit the movement to the case. You may be wondering about the catastrophe mentioned at the start of the post. At this point in proceedings, I usually try to take a couple of semi-decent glamour shots to show the watch off to its best. This being December, the month of low grey cloud, and 6 hours of daylight in this part of the country, my default location in the house to get decent light is the top floor bathroom. Depending on conditions, I usually take my photos on a surface adjacent to the window, taking advantage of the generally indirect and soft lighting at this location. but as you may notice, the paint on the sill is weathered and pock-marked and was reflecting in the polished sides of the watch so I thought I’d place a card beneath the watch to provide a cleaner surface. Unfortunately, having done so, an errant gust of wind gained purchase on the card and in a blink of an eye the watch was gone. Rise and fall indeed. Postmortem to follow. No! You must be joking! No chance of repair at all? No joke, unfortunately. The watch landed on concrete too before coming to rest in a drainage channel. I am hopeful that all is not lost though. These Seikos are tough. Good grief, serious bad luck! This post had me on the edge of my seat! I hope its salvageable. 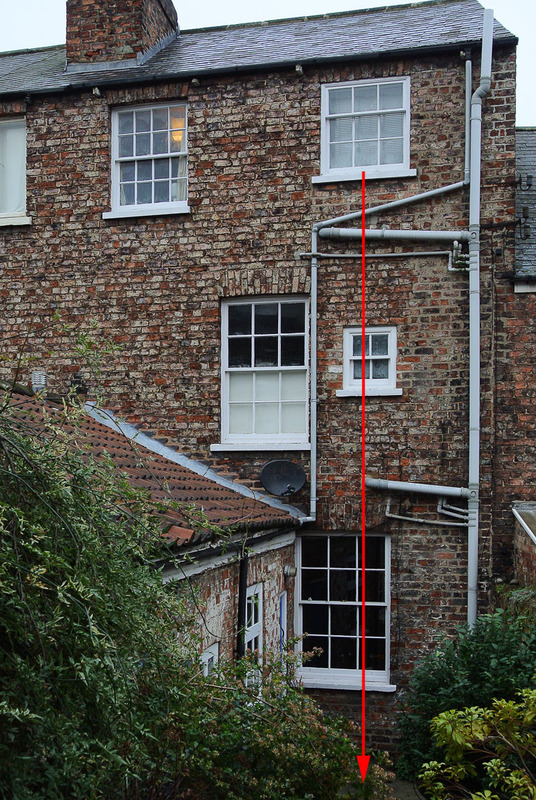 What was the minor cosmetic issue you mentioned at the start of the post…the two black dots? Yes, the two black dots. I probably thought they were on the crystal rather than the dial but in any case, not really that big a deal – certainly not now in the grand scheme of things! OUCH !!! Believe me , I feel your angst . I just opened the storage safe where I keep my watches and 2 vintage Seiko Actus watches hit the ground . One survived the crash , but the other one is in the observation ward . Martin , as always , your articles are interesting , entertaining , informative , and suspense filled . Tom Clancy has nothing on you . 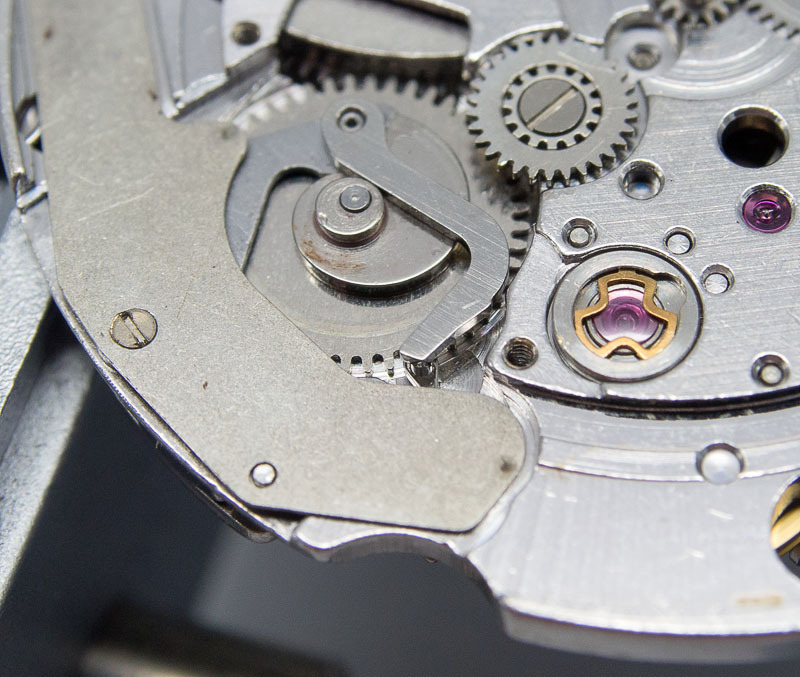 By far the most gripping tale of watch servicing I’ve ever heard. Are you kidding…after all that work and waiting for parts it falls out the window?? Horrible luck! Horrible luck combined with reckless stupidity! Martin, I was reading your blog on the Sportsmatic. How does one use the date quickset button? Are there times it should not be used? The quickset button on the 7606 operates just as on the Bell-matic. You push it in against its spring loading and each push advances the date. I generally tend to avoid using any quickset after about 7 or 8pm because the mechanism is then on the cusp of its natural changeover but I don’t think there is any danger of causing actual damage if you do so – at least not with that particular movement. I have read elsewhere that the notorious problems with the 56 series movements derive from folk using the quickset at inappropriate times but I have no direct negative experiences of my own in this regard. 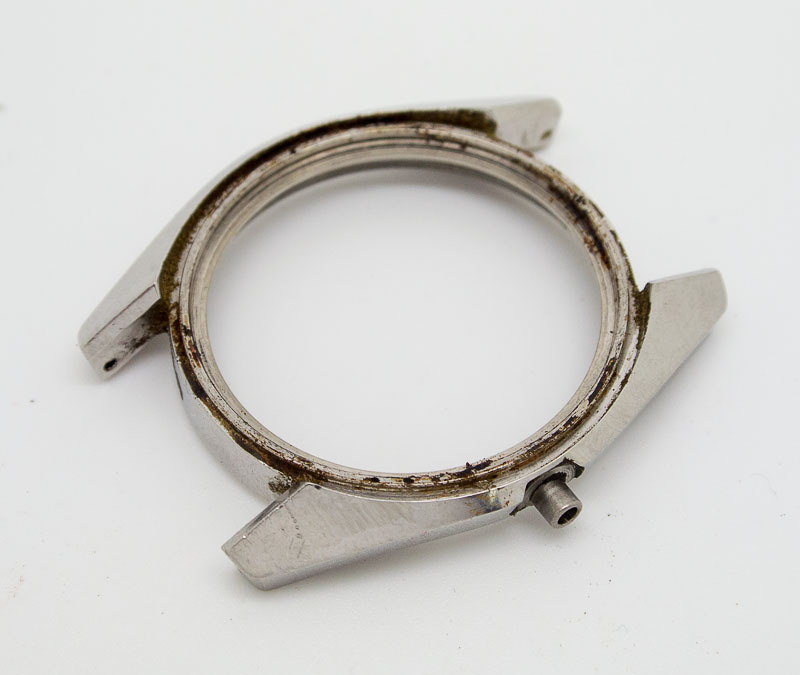 Martin, I have the same watch that’s in need of some attention – I was wondering where you got the L shaped crystal gasket (and what the ref is), and also if you know a source for the crown gasket? Hope you’ve rescued this watch since! 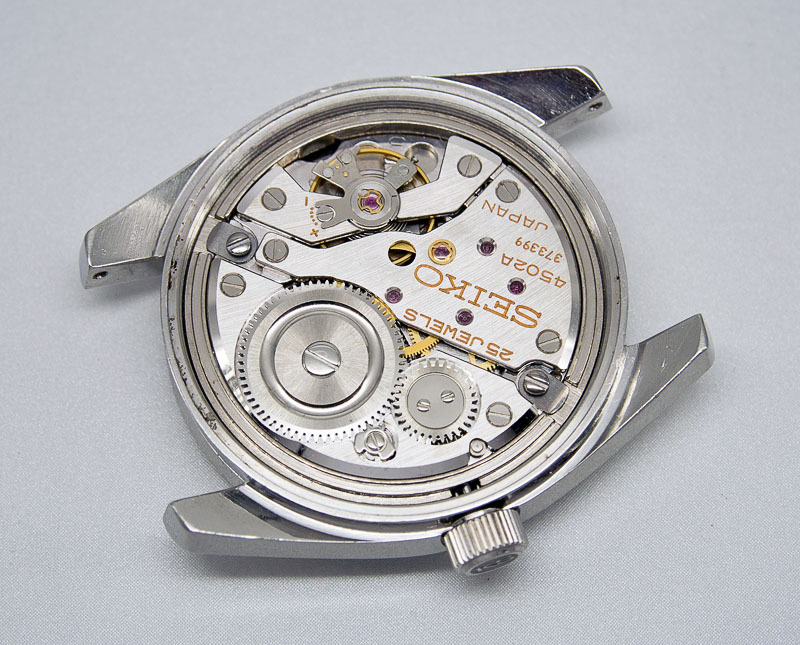 Thanks Martin, I actually got a bunch of nos parts off schillachi61 for the watch – the gasket indeed, was not one of them. 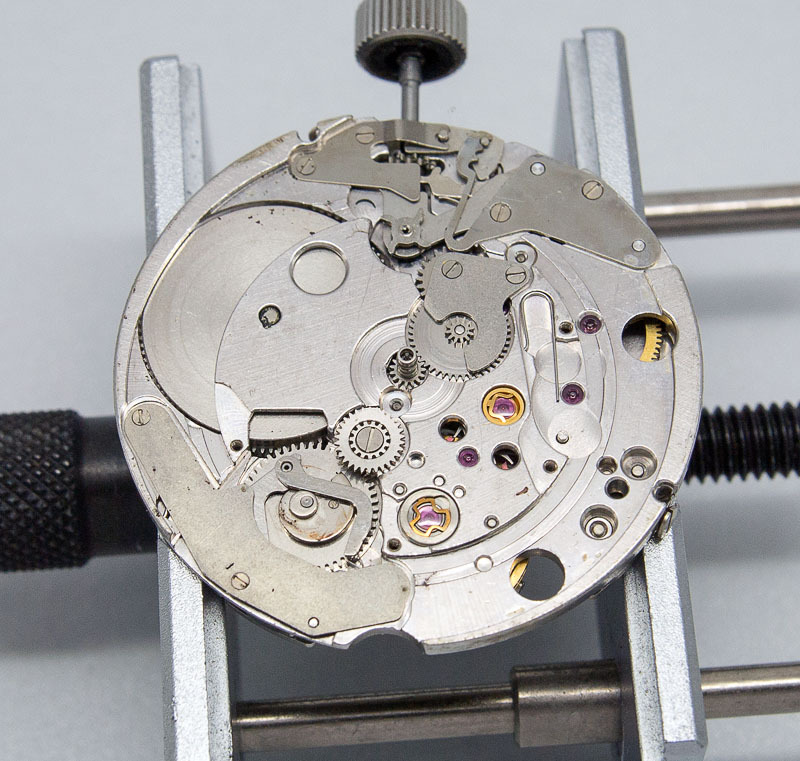 Only managed to get a caseback gasket so far. Great to see how your watch ended up in the end! Interesting post indeed. I’ve just got myself the same one, KS 4502A. Unfortunately, the date dial is replaced by a junk one and not working very well. Wonder where I could find a genuine date dial part. Please advise me. Many thanks! I am not sure where you are based but the first port of calls would be watch materials houses such as Jules Borel in the USA or Cousins here in the UK. If they don’t have stock (quite likely not I suspect), then the next stop would be Ebay but probably more likely of success, Yahoo Japan auctions. Good luck! Many thanks, Martin. I am based in Vietnam. I am trying to find one on Ebay and Yahoo Japan auctions now. Hi, I just bought a 45-7010 KS and I stumbled upon your blog. What a great restoration!! 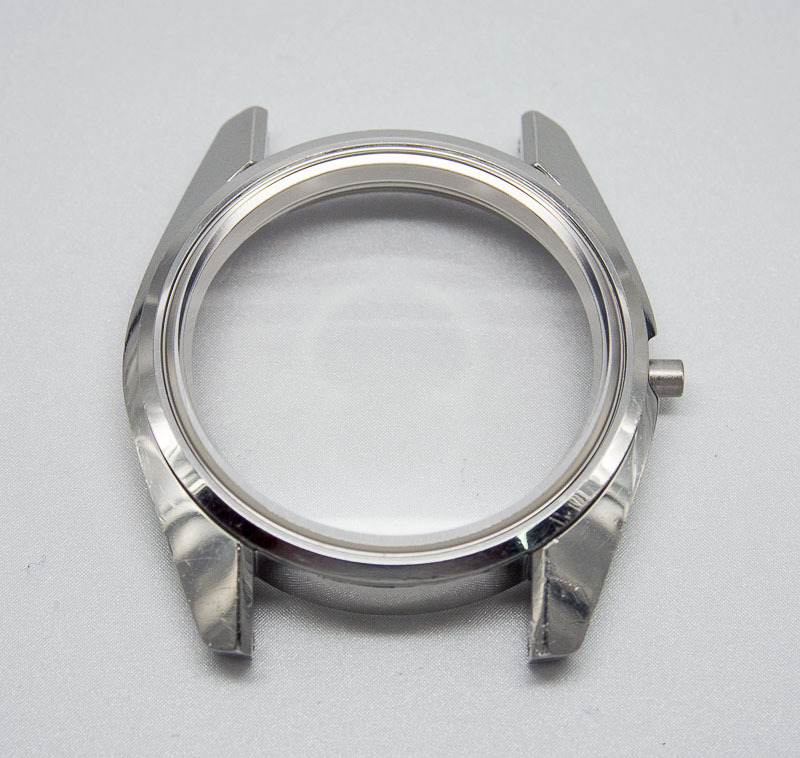 I am looking for a crystal and gasket for my watch, and I believe that the crystal part number is 300v05gns, but I cannot find the gasket part number. 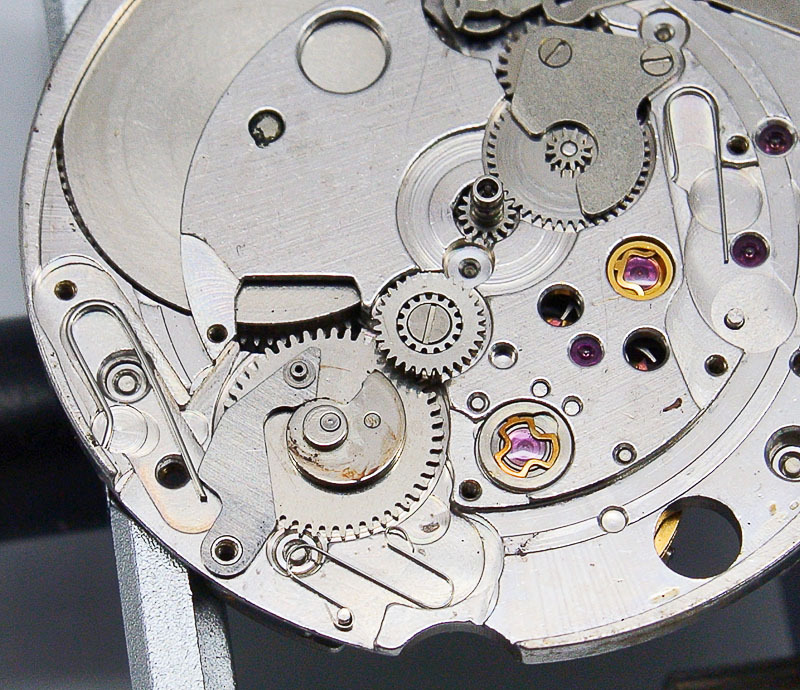 Do you remember if your watch used the same crystal, and if so, the gasket part number? 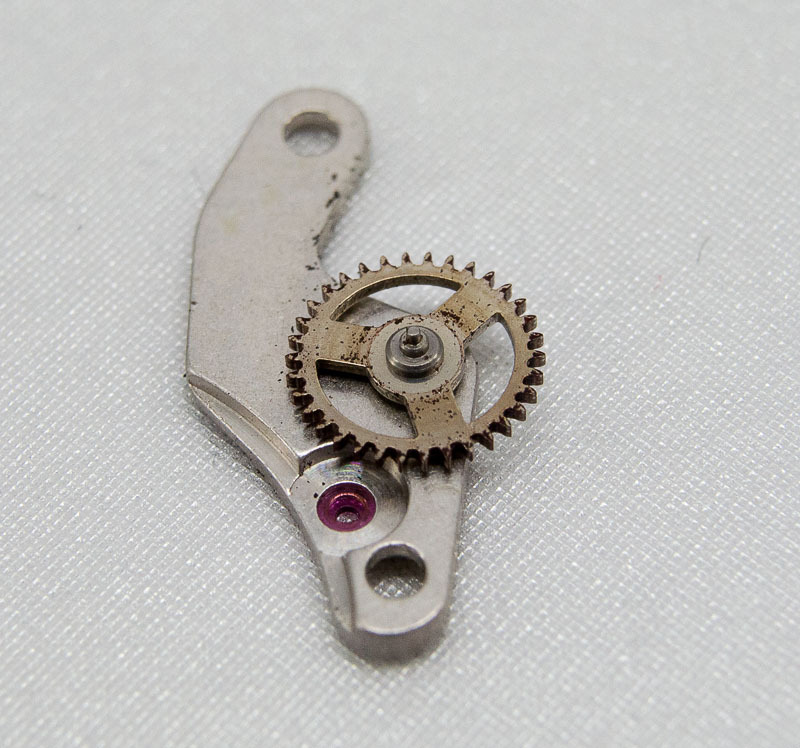 The part number for the crystal for your watch is 300V07GNS which is the same as for the 4502-7001. 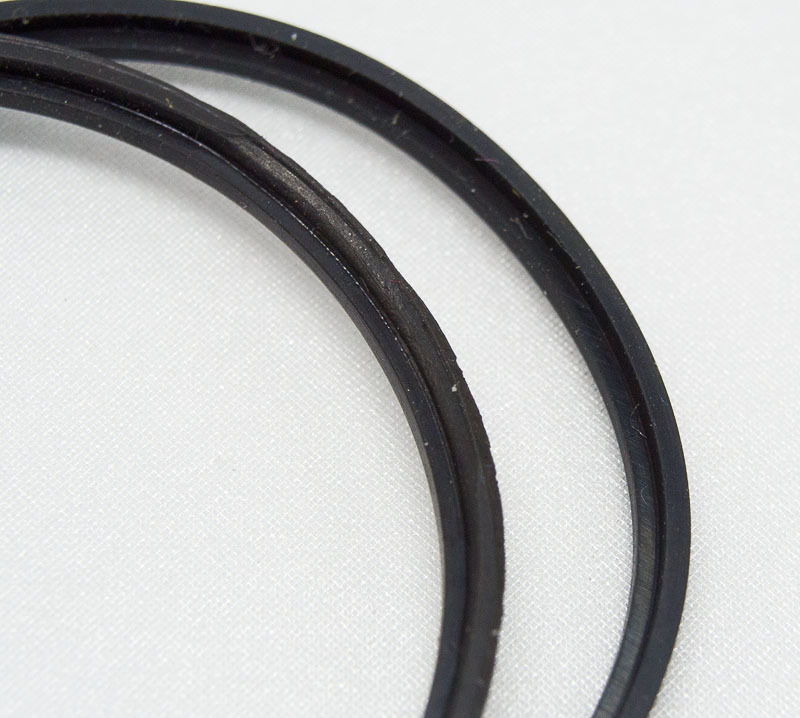 The gasket part number is EC2818B. Both of these are reporting as obsolete on Cousins site and I suspect you will struggle to find anywhere with stock. Occasionally, these sorts of parts surface though from sellers on Ebay and on Yahoo Japan but in the latter case, often at extortionate prices. As far as the crystal is concerned, a fall back strategy is to remove the crystal from the frame and glue in a suitably sized replacement. Removal can be either impossibly difficult or very easy, depending on the approach you choose to take! Hi Martin, thank you very much for such a quick reply, it is much appreciated. With your instructions I managed to replace the crystal of my 45-7010. I didn’t find the correct part number, but I noticed that some of the crystals whose reference starts with 300V only differ in the size of the metal ring that supports them, so I bought one and transferred the original ring to the new crystal, which is identical to the old one. To remove the rings I heated both crystals wth a small torch until I was able to pry the frame apart -taking care not to burn myself or crack the crystal-. I then cleaned the old glue with some peg wood, and re glued the crystal with some UV crystal glue. I must say that the watch now looks mint, apart from a small fracture that is starting to develop in the bezel. Do you happen to know the part number for the bezel? Well done on successfully completing the transplant! I am away at the moment without access to my parts catalogue so won’t be able to help with the part number until I am back. In the meantime you could try the Jules Borel database. I really like reading your blog. Your post post on the Seiko KS with the 4502 movement inspired me to buy one of my own. Mine is in great condition except that it is missing that case spring. 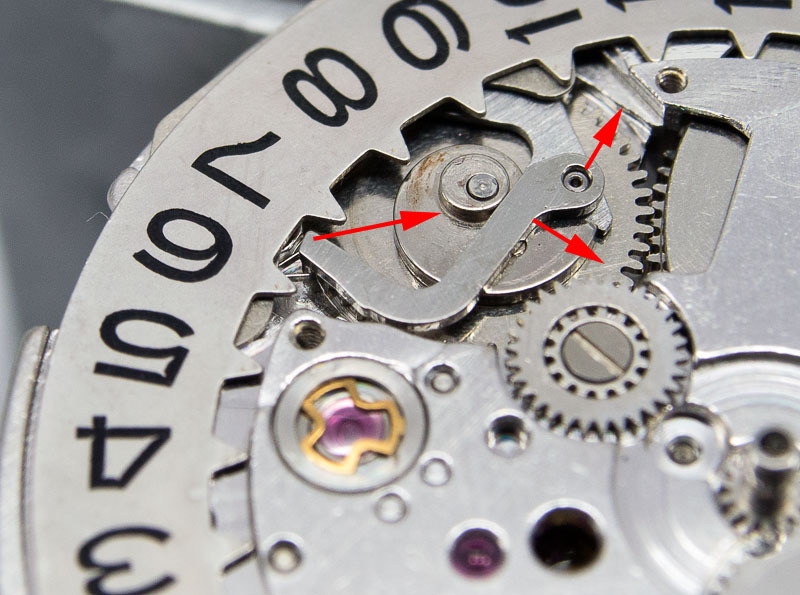 These means that if I shake the watch near my ear there is a rattling because the missing case spring means theres a bit of a gap between the movement holder and the case back. It does not seem to hurt anything and cannot be heard unless I shake it near my ear but it is still annoying. Do you happen to know where I might find a replacement case spring or what the dimensions of the case spring are? I’ll take a look in my parts catalogue when I get home to see if there is a number there. 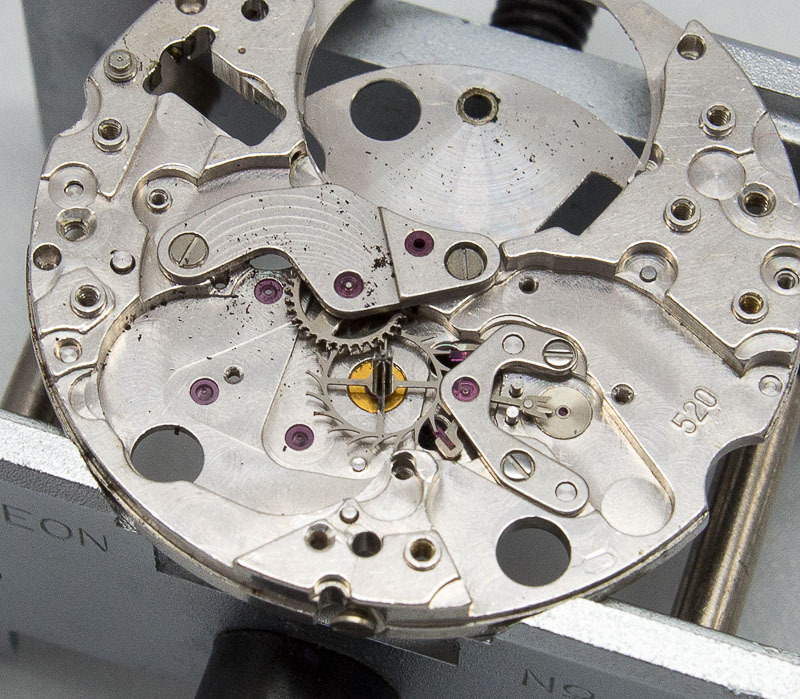 If so, it is possible that you might be able to source the spring from a watch materials house. Sorry, no luck on the part number. Hi again. 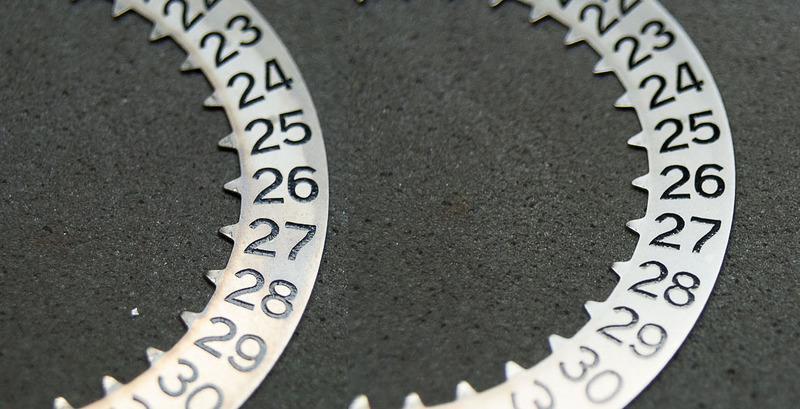 You said that the “date wheel was quite tarnished and needed a good going over to get it looking its best”. It certainly looks impressive. Is that just using Rodico, or wiping with a dry microfibre cloth, or does a good going over involve something else? I used Rodico. 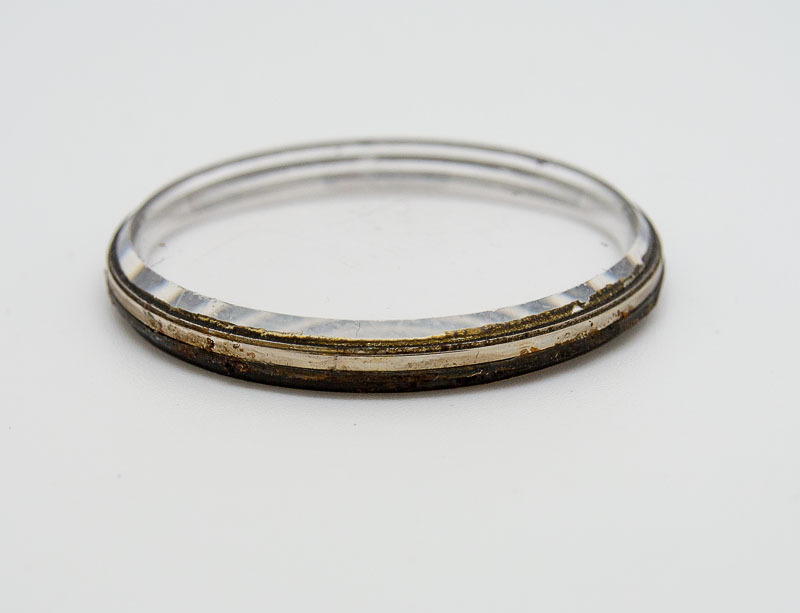 It is brilliant at removing tarnish without damaging the printed text. Good to know. Thanks for the all the information you share, Martin. This was one of the best reads I had for some time. The end was unpredictable – no way. Thanks for taking the efforts to share in this realy good way. Thank you. I am glad you enjoyed it. Coincidentally, I’ve been wearing this watch for the past few days and it’s been performing like a champ. I live in Tokyo and have recently become obsessed with buying a King Seiko. I finally succeeeded in a winning bid on EBay. Now I just have to control the anticipation in waiting. Do let us know what you make of it when it arrives. Which model did you choose? tell me please, in what position do they extract the winding shaft: plant or stop second? From memory, I believe I extracted the stem from the winding position. I have purchased a watch similar to this one. 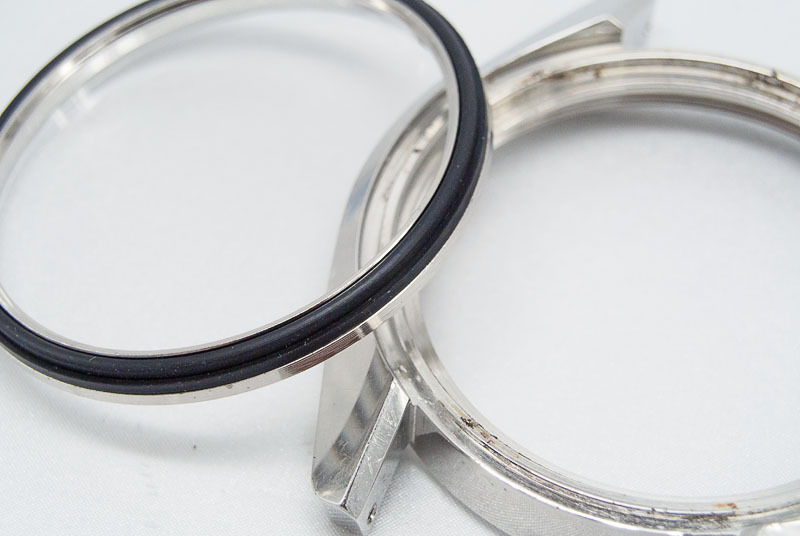 Do you know the part number for the bezel? Hi Sten, I don’t have my case parts book handy, but I’ll take a look this evening and get back to you. 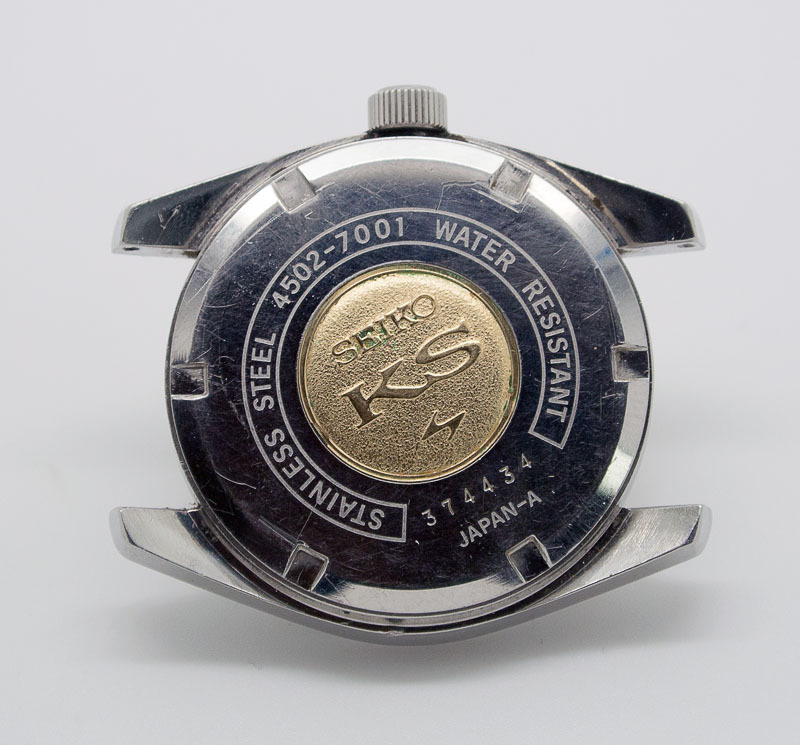 Sten, the part number for the bezel is 83330889. I hope that helps. Martin, thanks you are very helpful as always. … and one more thing if I may ask. Above you have written the crystal gasket as EC2818B for 45-7010. From what I can find in an online casing guide this is the same gasket for the 4502-7001? Also do you know where to find the technical guide? I have found movement part list. Again, I’d have to take a look at my casing guide but can report back. I am not aware of a 45 series technical guide – only the parts list. Certainly it does not feature in the two volumes that I have. Edit: Yes, that’s correct The crystal gaskets are the same for the 4502-7000 and the 4502-7010. Thank you – your help is much appreciated! Regarding the technical guide I just assumed that there would be a guide to follow in terms of lubrication etc. Did you lubricate based on experience/knowledge of how to do it? Somewhere there may well be a technical guide for the 45 series – probably in Japanese – but it is not included in the guides that I have and I am not aware of copies being available anywhere on the web. In this case, as in others, I had to perform the service without the safety net of a guide and so just followed my nose and used experience where required. I have a 5625 7070 on the way from Japan, the seller did more a gain of +40 seconds in 24hrs. Does this seem out of the ordinary to you or an easy fix for someone who knows what they’re doing? That is within the bounds of what could be corrected just through regulation but impossible to say for sure without putting it on a timing machine. I would always assume that any old watch bought from Yahoo or eBay will need a service unless there is documentation of a recent service. Very good! Thanks for your advice. I spoke with a watchmaker prior to the purchase and she said given the condition, age etc the reward outweighed the risk in her opinion. I have the same watch and i would like to change the glass too. What référence from cousins did you bought? The part number is 300V07GNS but long since sold out at Cousins (they list it as obsolete). I love this post – and I read it as if it was one of the great classic short stories. Initially I read this a couple of years ago, and had forgotten all about it. Now I read it again with great satisfaction – without realizing that it was the same post I had read earlier until the disaster scene appeared again. Bravo! A very entertaining and inspiring read! Glad to hear this little tale still provides some entertainment! Thanks for the comment. Terrific post. Excellent information and well written too. Perhaps you can offer some insight on a 4520A I am currently servicing. After cleaning the parts, I discovered a thin washer lying on the bottom of the ultrasonic tank. 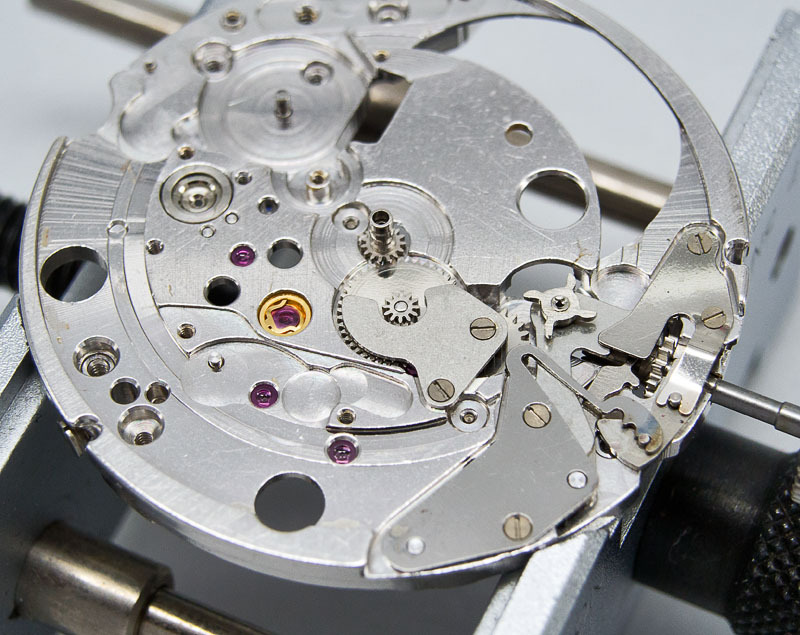 I measured a thickness of 30 microns so this leads me to believe it is the “hour wheel ring” (part #493002) as described in the Seiko 4520A parts catalog. I’m not sure of the purpose of this part, nor the exact location it should be placed in the movement. What are your thoughts on this matter? 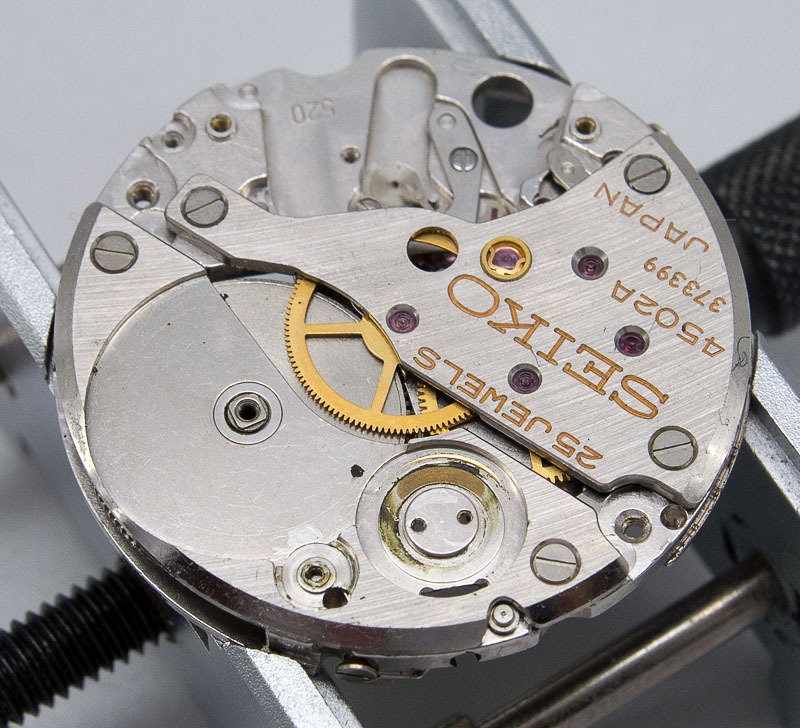 I have not encountered this part in the 45 series I’ve worked on so far and can only assume that it is a spacer that is required for particular models where the dial design requires it. I have two or three 45 series waiting in the queue and will be sure to keep an eye out for it! 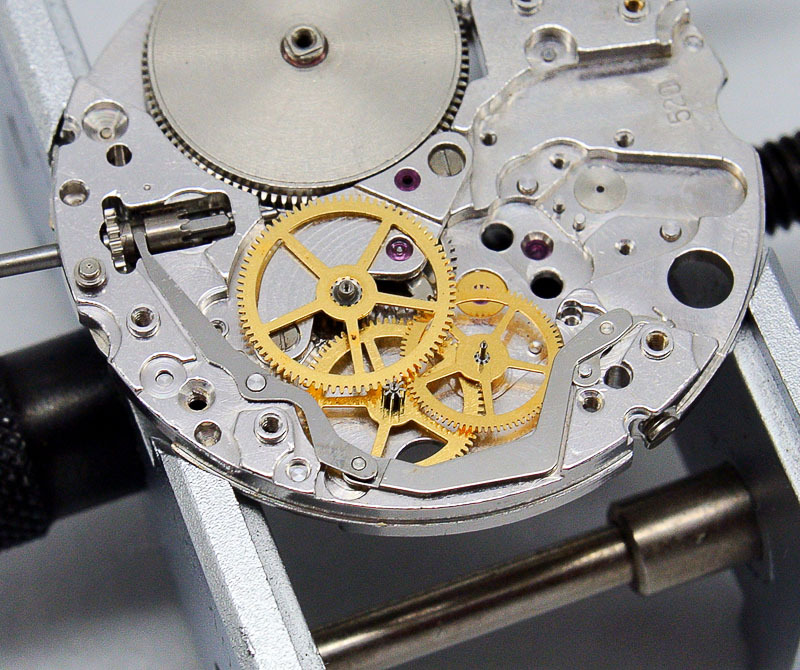 I’m currently servicing a 4520A and wonder if I should lubricate the mainspring (the original one, after cleaning). I remember reading in a another post that you left it unlubricated, but that was for a manual-wound low-beat movement. My general inclination would be to lubricate it. 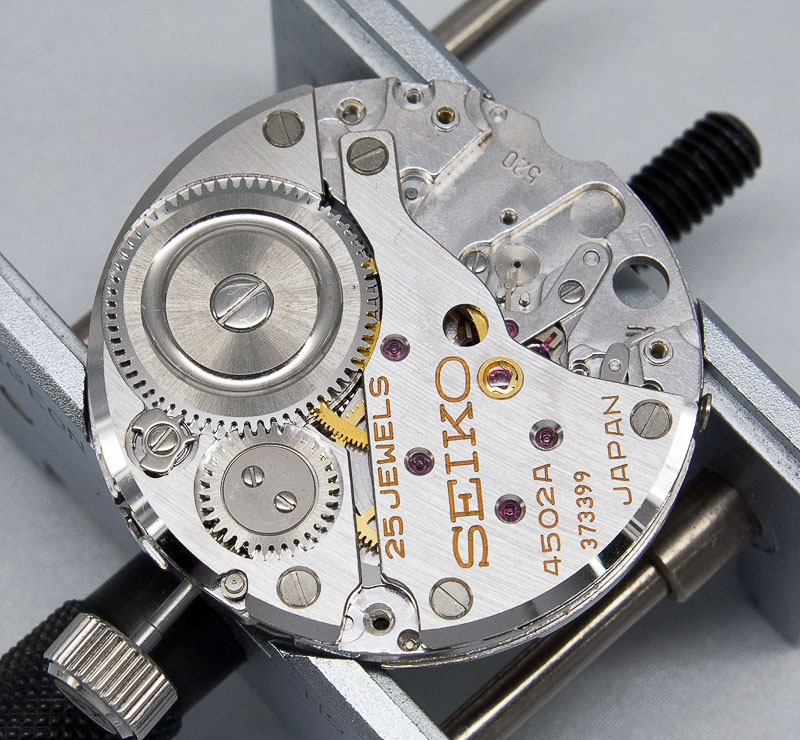 The Seiko technical manuals suggest that the manual wind unbreakable mainsprings are self-lubricating but of course you do still have to lubricate the arbor where it contacts the holes in the barrel and lid. 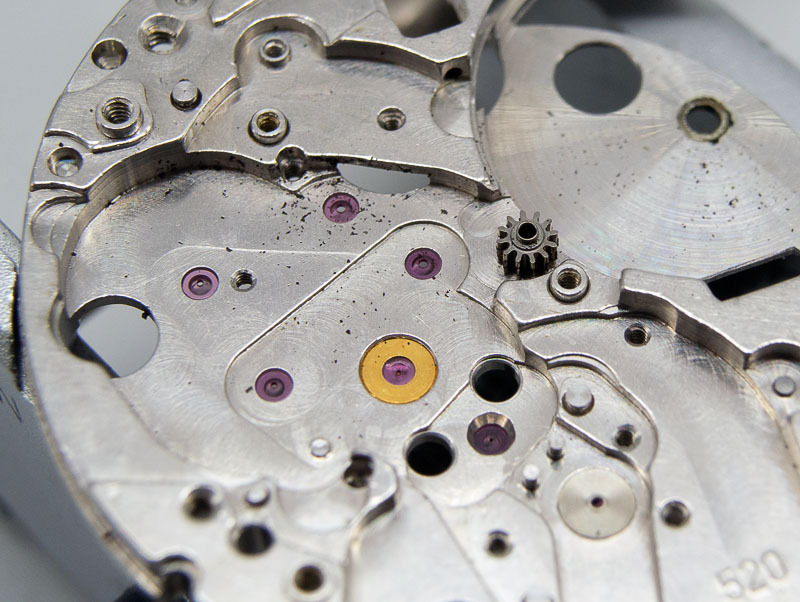 If you are reusing the original spring, then there may be a case for lightly oiling the mainspring but I think opinions on the merits of this will depend on who you ask!